Birding S.E. Arizona, Aug. 24th 2013. My goal, the Blue-footed Booby spotted at Patagonia Lake. From my previous post you'll see I wrote about that event and now I'd like to elaborate on the rest of the day. If you ever go to Patagonia Lake, a good place to start is at the Visitor's Center. They feed hummingbirds and no telling which species may stop by for nectar. I caught a photo of a handsome Broad-billed hummingbird. Along the water's edge were these little gems, a Yellow Warbler and Bewick's Wren. Other birds I spotted were Pied-billed Grebe, Great Blue Heron, Black Vulture, Turkey Vulture, Osprey, American Coot, Phainopepla, Neotropic Cormorant and Mallards. The Black Vulture made my 'lifer' list and I have a poor photo to prove it. I went alone to the lake, but "joined" some very gracious birders, Gordon Karre, Tommy D. and Muriel Gordon Neddermeyer. Patagonia Roadside Rest Area, just south of town. Right away we spot birds and birders. All were looking at a belted kingfisher, which I missed, however I didn't miss this Thick-billed Kingbird. There was also a few other's sightings of Western Tanager, White-breasted Nuthatch, Phainopepla, Lucy's Warbler, Acorn Woodpeckers. (Tommy has a list on eBird). I didn't see all that they did...long story. Next, we make our way to San Rafael Grasslands. So many birds, I'll make a slide show. Paton's Place would be our next stop. After a tip from Larry, the caretaker of Paton's we find a hot spot for another 'Code 4' bird, the Painted Bunting! Due to the bird's timidness, my photo is highly cropped and blurry, but you can see in the background is a female painted bunting that I image is this juvenile bunting's mother. My eBird list is 25 species on that stop. 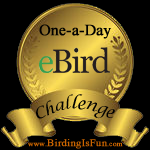 Bird list for the day is a whopping 65 birds, give or take a bird. Not bad for a short day of birding! My lifers were; Obviously the Blue-footed Booby, and Eastern Bluebird, Painted Bunting, Grasshopper Sparrow, MacGillivray's Warbler, Blue Grosbeak and Black Vulture. The Yellow-billed Cuckoo was only heard twice, not spotted.